Rather, it's the chance to get to know the person behind the work, while simultaneously watching their skills and grasp of the medium increase almost exponentially with each new project, which provides the real thrill and enjoyment for me. I suspect that much of my pleasure arises from the simple truth that the act of observing an artist's journey of self discovery and fulfillment through their work over the years, watching as they move from novice to journeyman to seasoned master of the craft, provides incredible opportunities to understand both the individual artist under consideration, as well as the greater possibilities inherent to both humanity and the art form itself. So, what the hell does all this have to do with Andy Runton and his forthcoming Owly, a largely silent comic that's deceptively simple and child-like in appearance? Quite a lot, actually. That's because, despite the fact that this marks the first official "professional" publication of Runton's comic book work, even the most jaded and unforgiving critic can see that he's an artist who's not just gifted, but one who's well on his way towards becoming a master of his craft. All of which means that I'm faced with the possibility that much of this newbie's growth has already occurred, unseen, and I missed my chance to watch his work mature and grow like some miraculous garden as is my wont. But that's just me being selfish, I suppose. It seems that I'll just have to console myself with rereading Andy's ashcans, and marveling at how someone can get it so right the first time out. You, on the other hand, shouldn't let such considerations stop you from picking up and enjoying Owly. In its pages you'll discovering a world o'er filled with beautiful line work, subtle and nuanced cartooning, deceptively simple storytelling, and so much heart and soul and - dare I say it? - sheer joi de vivre that it can bring a smile to the face of even the most stoic among us. So I don't get my little thrill. Instead, we all get Owly, a simply brilliant debut from a talent who'll be providing us with fun and funny yet still thoughtful stories for the foreseeable future. Sounds like a fair trade-off to me. Bill Baker: Why don't we start off with a little background on both you and your work? Who are you, where do you come from, how'd you discover your love of storytelling, and what about comics make them the your medium of choice? Andy Runton: Okay, well, my name is Andy Runton and I live just outside of Atlanta, Georgia. I've always loved cartoon characters, whether they're animated, in comics, or even if they're corporate mascots. The Muppets, the Disney characters, School House Rock, Paddington Bear, the list goes on... those are the things I grew up with in Florida. The thing that is special about comics is that you get to know the characters through a story. It's not just a whole bunch of pictures of them posing. I always think about that kind of stuff when I see a character... who is that little guy? How does he act? Comics lets you answer all of those questions. If you're familiar with Calvin and Hobbes, think about those characters. You know who they are and you know how they'll act. You know their personalities. That's the power of comics. BB: How about Owly, both the character and the series? How and when did you dream up this critter, what was the development process like and how long has it taken to get it to this point? AR: I've drawn Owly for years. But I only recently put him in my comics. I studied Design in school, and our department was in the School of Architecture. All-nighters were extremely commonplace (and even expected). Over time my schedule shifted. After a while, I found that I would stay up all-night on a regular basis. I would leave little notes for my Mom (to let her know when I finally went to bed) and I always drew this little owl on there. He would be doing little things, usually sleeping in the trees. Over time he evolved and got all kinds of little friends. I've read comics for as long as I can remember. But I actually never considered a career in comics until recently. I became completely disillusioned with my corporate job and began searching for something else. I loved cartoons and animation but I didn't want to move out to California, and I really never wanted to do daily gag strips, so I looked to comics. I loved the edginess of the black and white TMNT stuff (courtesy of Kevin Eastman and Peter Laird and company) that I grew up with. Then a friend of mine turned me on to Hellboy by Mike Mignola. The design was amazing. The spark was there. I tried to do super hero comics. It was a disaster. They always felt forced and over-calculated... just a crazy combination of all of the movies and cartoons I'd ever seen. It just wasn't me. Around that time I started to dabble in independent comics thanks to the wonderful work of Jim Mahfood and Scott Morse. I loved the personality in these books and the artwork just blew me away. While waiting for a friend at DragonCon in Atlanta, I bumped into Chris Staros and Top Shelf. I bought five books that day: Tales of the Great Unspoken by Aaron Augenblick, Low Jinx #2: The Horrible Truth about Understanding Mini-Comics, Quit Your Job by James Kochalka, EXPO 2001 (the SPX anthology), and Good-Bye Chunky Rice by Craig Thompson. I couldn't believe what I was seeing. These books were so personal. For the first time, I felt that I might have finally found what I wanted (and needed) to do. That was just about two years ago. Once I decided to use the little owl that I had overlooked for so long, the stories just flowed out. What is it that Joseph Campbell says? "Follow your bliss" and you'll be helped by invisible hands. That was definitely the way it was for me. BB: It's hard not to notice that the book is basically "silent", with little or no actual dialogue being spoken by the characters. What lead you to adopt that approach, and what kind of different effects might that choice have upon your approach to the work, much less the portrayal of the characters? AR: Well, because Owly had existed for so long on those little notes, when it came time for him to be in a comic it just didn't feel right making him talk. How would he speak? Would he have an accent? I decided... no... he won't talk. I would convey everything with expressions and body language. But then I ran into some difficulties. Some things are hard to say in just static pictures. Then I saw Where Hats Go by Kurt Wolfgang. I could never do what he did, but I used to design computer icons for a living. Good icons can convey complex ideas clearly. I brought that into my comics. It does make some things hard to say but that's what makes comics so interesting for me. It's such a complex medium. It truly is the hardest thing I've ever done. BB: It's also hard not to notice that, despite the surface "funny animals" sheen on the work, there's a real underlying sense of weight and thoughtfulness, even a sense of bittersweet melancholy that imbues the Owly books. Is this a conscious tactic on your part, a layer of meaning and mood you've worked very hard to create, or does that all just seem to happen and be a natural part of this book? AR: It's not a conscious tactic by any means. Owly isn't aimed at a certain demographic or anything like that. These stories are personal for me. I guess the melancholy is just part of my personality. I do work hard to make sure the stories work on multiple levels. A lot of that has to do with just writing the kind of story that I always wanted to read. These characters are real for me they're not just one dimensional cartoons. I think about all these things when I'm working on a story and thankfully, it just kind of all comes together by the end. BB: Well, what makes a particular story one that's appropriate for an OWLY adventure? AR: The Owly stories are really about emotion with a little bit of excitement and comedy. I'm not sure if I could have anyone else write an Owly story because they are so personal. BB: How's a typical Owly created, from inception to finished page? Do you work from tight, fully written scripts, a loose outline, or do you just start with a notion and follow it directly upon the art boards, seeing where it'll lead? AR: I usually start out with a little kernel of an idea... usually based on a real event. Then I think about how Owly would react in that situation and what would happen. It's kind of hard to describe. I think about it for a long time, writing down little things and talking it out with editorial team (my Mom, Rob Venditti and Chris Staros). Once I get something worked out. I sit down and thumbnail out the story. Usually all at once. Then I go back and edit it. Taking stuff out, adding scenes here and there, playing with the flow. Then I show the story to my editorial team and my friends. They give me all kinds of feedback on what's working and what isn't. Then I start drawing the final pages. I think there is something about those initial rough drawings that is inherently unique and special. So I use them as an underlay for my final drawings. I think that helps me keep the emotion in the final product. BB: So what's coming up for Owly in the near and far future? 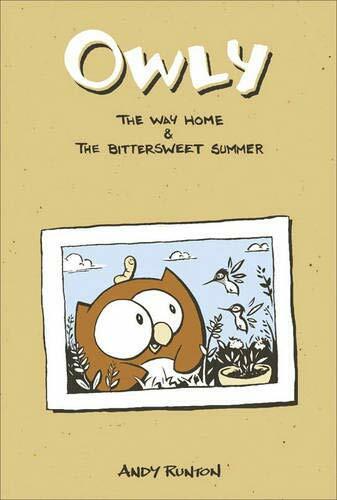 AR: Well, I just signed a contract with Top Shelf for Owly as a series of graphic novels. So this is just the first of hopefully many Owly books. BB: Any other projects in the offing? AR: I have a few little projects that are coming together on the side but Owly is my focus. BB: What would you like your audience to get from Owly? Is it all about pure entertainment for you, or are you trying to do more with this series? AR: It's definitely not just about entertainment. But I'm not trying to be preachy either. The Owly universe is my world. Take a look around and hopefully you'll walk away with something. BB: What do you get from doing this work, personally and professionally? AR: Personally, working on Owly makes me the happiest I've ever been. I'm able to write about the things I want to write about and draw the things I want to draw. I mean, I get to draw all of these characters that I love... fulfilling doesn't even begin to describe it. Professionally, this work, as I've said, is the hardest thing I've ever done. That's what keeps me going. Every story is a new challenge. BB: Anything you'd like to add before I let you get back to it? You can see some of my other work at my website, www.AndyRunton.com Stop by and say hi, I'd love to hear from you.